The traditional Master Cleanse recipe calls for lemon juice, maple syrup and cayenne that you must squeeze, stir and mix together! This is not only messy, it’s time consuming. 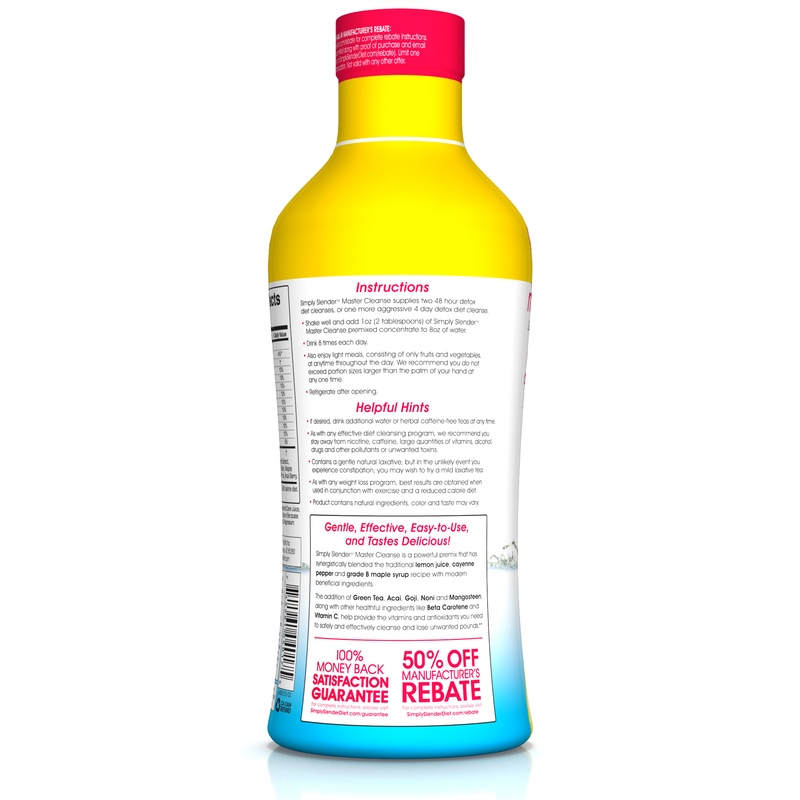 Simply Slender Master Cleanse is a premixed concentrate that you just add to water! It’s that easy. Each bottle of Simply Slender supplies two 48 hour detox diet cleanses or one more aggressive four day detox diet cleanse. All you need is the Simply Slender Master Cleanse mix and water and you are on your way to a lighter, healthier you! The Master Cleanse is known by many people as the best detox diet and the best body cleanse for weight loss. It was introduced by Stanley Burroughs in the 1940s and continues to stand the test of time. It consists of lemon juice, grade B maple syrup and cayenne pepper, and has also been referred to as the Lemonade Diet, the Maple Syrup Diet and the Cayenne Pepper Diet. It was published in Burroughs’ book, The Master Cleanser and Healing for the Age of Enlightenment, in the mid-1970s and was famously used by Beyonce Knowles in 2006 to prepare for her role in the movie Dreamgirls. While many people have experienced it as an effective body cleanse for weight loss, most criticisms point out that the detox diet lacks essential nutrients. This was what inspired Simply Slender to create The Original Lemonmade Diet Premixed Concentrate. Do not use this product if you are pregnant, breast-feeding, have a kidney or gallbladder disorder or disease. This product is not recommended for prolonged use. If you experience minor nausea, diarrhea, dizziness or cramping, discontinue use of this product. If symptoms persist, seek medical help. NOTICE- This product contains cascara sagrada. Read and follow directions carefully. Do not use if you have or develop diarrhea, loose stools, or abdominal pain because cascara sagrada may worsen these conditions and be harmful to your health. Consult your physician if you have frequent diarrhea or if you are pregnant, nursing, taking medication or have a medical condition. *These statements have not been evaluated by the Food & Drug Administration. 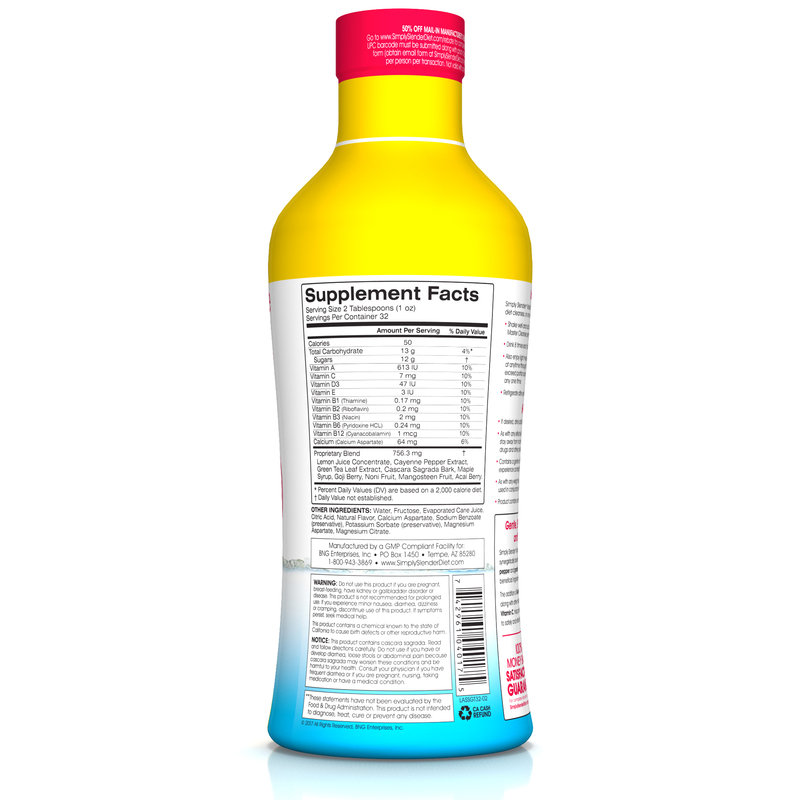 This product is not intended to diagnose, treat, cure or prevent and disease. I was unsure if this would work for me, but I was super excited that it did! I tried this after hearing about it from my friend. It tasted great and i lost 5 pounds in during the 2 day cleanse! I pre-made the portions into 8oz bottles so, it was easy to drink and go! I can't wait to try this again for spring break! I was so bloated and lathargic. I feel so much lighter and happier and had more enery after using this product! have to admit, I actually like the taste, and even though I have had "cheat" days, I'm still seeing results. I'm not anywhere near my goal, but I believe if I continue drinking this cleanse (and remain consistent with fruit, veggies, and the tea), that I will eventually. I have sense referred two other people. Did it for 4 days and lost 6.7 pounds! Slight headache the first 2 days but day 3 and 4 I had so much energy! Easy to use and very convenient. Product works and the taste is good. Worth every penny! The product works as described and taste better than I thought. I will definitely be purchasing again. Ehhh I'd say it's alright. I had to add lemon juice and maple syrup to make it taste better even add a little more cayenne, without doing those steps it tasted odd and I would not have finished it up.